Instantly make use of user-submitted content with front-end posting in WordPress. Build directories, photo galleries, user profile pages, or a site driven by user-submitted articles and blog posts. It was while searching for a solution to front-end posting in WordPress that I first discovered Formidable. My project needed to turn form submissions into an online directory of participating businesses. It didn't take much research to realize how perfect Formidable was for this task. Since that initial project, I've used front-end posting on numerous websites. I've also found it a great content management tool for clients who find the WordPress dashboard overwhelming. Letting them add new posts via a front-end form is often more user-friendly. Two ways to leverage front-end posting in WordPress! That's right. This feature is so good we built two different ways to take advantage of it. Each method has its own advantages, but between the two, almost anything is possible. Create pages and posts from forms, or use Views to display submitted data in custom layouts. Using Views is perfect for photo galleries, classified ads, or property sales websites. Creating posts or even new pages directly from a form opens up a world of new options for your WordPress website. Guest authors can post on your site without extra permissions or access to the WordPress back-end. User submitted content goes from being an occasional bonus, to the driving force of your online presence. As you would expect, all form submissions can be moderated and edited before appearing live on your site. This allows you to power your site with user-submitted content. If you are building a directory website, you can even charge per listing. Pay-per-post functionality can also be used for classified adverts websites. Even better, you can allow users to edit their own submissions. For business directory or classified adverts sites this is especially useful and greatly reduces admin workload. What if you want to display the form submissions in a different format? Posts are great, but displaying them in different ways can be tricky. Views allow you to display form entries in a completely custom way. You can display entries in rows, columns, or in a grid. With some custom CSS you can use accordions or masonry layouts. Create anything from minimalist photo galleries to detailed technical specification sheets, all using the power of Formidable Views. You can also display an overview listing of all entries, with links to more details for each individual item. This lets you highlight the important details on the list page, and display the full listing on the detail page. Perfect for realtor websites or business directories. Make your form entries searchable with a fully customized search form. Easily customize the look and layout of your View, and even apply custom CSS to elements within your View. Want the best of both worlds? 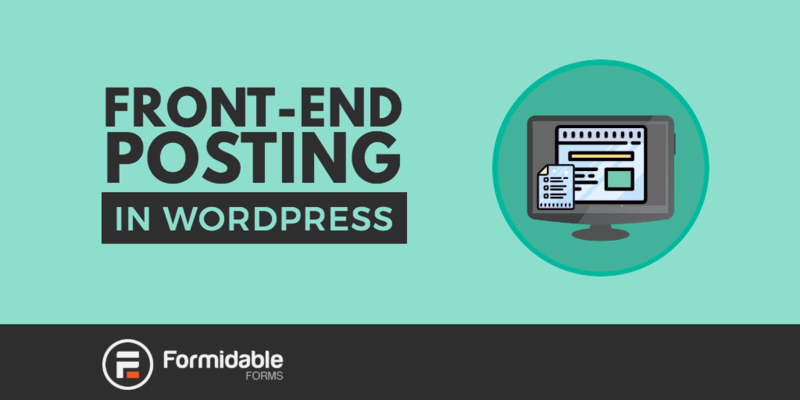 When front-end posting in WordPress with Formidable, you aren't limited to a single method! One way to combine both methods is to build a View which displays an overview of form submissions. Then build a custom search form that allows you to find the entry you want. In your View, link listings to the pages or posts that were created via your form. This gives you the flexibility and customization options of Views, along with the SEO benefits of posts combined in a seamless integration. Not using Formidable Forms for your WordPress forms? Learn more about the features of the best online form builder plugin or try out our free WordPress form builder.